Originally the January 2002 Special: The genius behind Ranma, Urusei Yatsura, Maison Ikkoku, Inuyasha, and many other titles have been regalling us with her creativity since the 1970s. Take a glimpse of her short bio. 2002 special written by Firesenshi. 2011 Update notes by Skysenshi at the bottom of post. Who hasn't heard of Rumiko Takahashi in the entire animanga fandom? She's easily one of the most famous and most lovable mangaka around. Many of her works have become instant classics—the most successful to date being Ranma 1/2. Some of her other popular titles include Urusei Yatsura , Maison Ikkoku, the Mermaid Saga, and Inu-Yasha, which is her latest installment. She is also the author of many short stories (i.e., Rumic Theatre). Rumiko Takahashi was born in the year 1957, in Niigata (Japan). She attended college at the prestigious Nihon Joseidai. At the same time, she also enrolled in Gekiga Sonjuku and was trained under the infamous Kozuo Koike (author of Crying Freeman). For several years during her days in the university, she boarded on an apartment in a small district in Tokyo. It was during this time that she became neighbors with a funny group of people who lived in another apartment just behind hers. This was the inspiration for Maison Ikkoku, a tremendous hit that surpassed even its successful predecessor, Urusei Yatsura. But truly Takahashi has outdone herself, for she came with another hit, an even bigger one that Maison Ikkoku ever was—Ranma 1/2. And there's no telling if she'll do it again, with her newest series, Inu-Yasha, especially when it looks very, very promising. What are the secrets to her success? Two things: great characters and charming wit. In the span of her career (which is roughly over two decades), this trademark of hers has been recognized. Rumiko Takahashi is known for writing stories that are mostly character-driven. No one creates characters like she does, for hers are unique and unlike anything else, in their hilarity, eccentric habits and unconventional situations. In her manga, there are always tons of slapstick, clever puns (the title "Urusei Yatsura" is a prime example) and Japanese references included (which is why it makes her wonder sometimes why her works are so popular in foreign countries ^^;). Oh, she's also very fond of legends, mostly Japanese and Chinese ones! Anyone who has encountered Ranma 1/2 will easily know that, but this fondness is also apparent in many of her other works. It might come as a surprise that such a popular mangaka best known for her romantic comedies, also writes horror stories. But truly, she proves her skill and versatility as a storywriter when Ningyo no Mori (Mermaid Forest) and Laughing Target came to be published. Both are genuine examples of her talent in weaving macabre tales. Now you see why she's so legendary? In 2002, Inuyasha won Shogakukan Manga Award for best shounen title of the year. In 2006, it ranked 20 on TV Asahi's top 100 anime series. These make Inuyasha one of her most successful titles to date. It also happens to be her longest, spanning 12 years, since it ended in 2008. Her latest manga, Rin-ne , began in 2009 and like most of Takahashi's titles, would find its way among the ranks of bestsellers. It is about a girl named Sakura, who can see ghosts, and her friend Rin-Ne, who is half shinigami and half human. Who hasn't heard of Ranma 1/2? Or even the latest Inu Yasha? 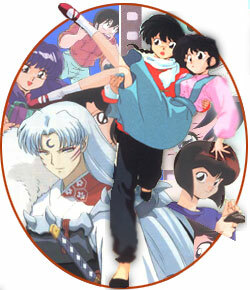 All are unforgettable anime from great genius Rumiko Takahashi. We just had to feature her works!